Despite the incessant list of creative traditional objects that command harmonious melodies in Uganda’s traditional musical pieces today, I am going to be a bit mean by selecting just one to introduce to you. With quite a number of similar and dissimilar names accorded to it by different groups of people in Uganda, the drum in its unique sound dominates the authenticity of Uganda’s traditional songs. 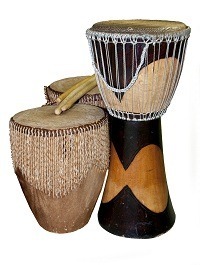 On a Safari to Uganda, you are able to not only see but also touch and showcase your rhythm through playing at least one of these interesting instruments that today, as was in the past, is used on a number of ceremonies and occasions like weddings, coronations, worship and healing rituals, celebration of twin births and in daily communal communications. The mainstream of Ugandan culture is represented in this instrument. Safaris in Uganda immerse tourists in the history that this drum in all its unique forms and sizes has; a history that dates back over a healthy number of centuries. The drum was, and continues to be used in all ethnic groups excluding only 2 (two) tribes, the Karamojong of North Eastern Uganda and the Sabinyi of the Mount Elgon area in Eastern Uganda. A visit to the drum-makers on a Uganda Safari and Tour further astounds you of the creativity that each and every Ugandan group showcases in the drums they make. The most common materials for manufacturing the drums in Uganda are locally sourced including wood, cow-hides (cow’s skin), and reptile skins ranging from casings of snakes to those of monitor lizards. The base of the drum is made from an artistically dug-out tree trunk. The drumming area is a fine layer of cow or snake skin fastened to the finely Modeled base by cords made of cow’s skin. Drums, like cows are very unique, with none resembling the other in decoration. The majority of Ugandans believe that the cradle of drum making is along the Kampala-Masaka highway (one of the more famous roads used for Uganda Safaris to the western National Parks), at a place called “Mpambire”. Drums of similar quality and diversity have providentially been brought closer to the tourists in different locations of the capital city (Kampala). For those who are indecisive about which souvenir to carry home with you on completion of a Safari Tour in Uganda, the drum is a perfect choice. How memorable that can be to carry part of Uganda home with you and tell a visible and never-forgettable musical story to friends and family about your first-rate Uganda Safari!